Leyland expects the digital drive to help tap its in-house strength as well as segments such as passenger cars and two-wheelers. 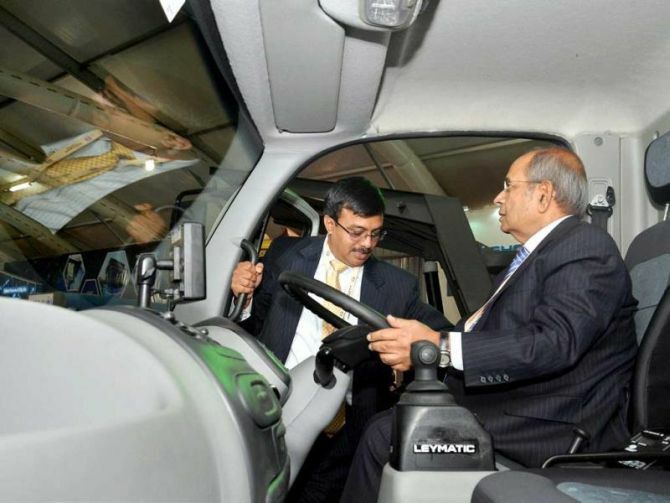 Image: Chairman G P hinduja (at the wheel) and Vinod K Dosari, managing director, Ashok Leyland, inspect a truck. Photograph: PTI Photo. Commercial vehicles major Ashok Leyland Ltd is embarking on a slew of digital transformation initiatives with an aim to further its aftermarket business. At a time IT is being seen as a key enabler and differentiator in a competitive business environment, Leyland expects the digital drive to help tap its in-house strength as well as segments such as passenger cars and two-wheelers. Backed by digital initiatives and other innovations, the company achieved its highest ever market share of 34.7 per cent during the first quarter ended June 2017. According to Dheeraj G Hinduja, chairman, Leyland, the company has managed to get there despite increasing competition because of investments in technology including iEGR (intelligent exhaust gas recirculation), and on plants and products. The company’s managing director, Vinod K Dasari, adds that digital has been a productivity driver for the company. Leyland identified digital as a critical strategy to tap the Rs 60,000-crore (Rs 600 billion) aftermarket, which is fragmented and largely unorganised. On an average, the distance between garages run by OEM (original equipment manufacturer) and service stations is about 100 km, while local garages are located every 3 km. The company mapped around 20,000 mechanics across the country to be brought into its new digital initiative fold. “These initiatives will be a growth driver for us and take us closer to our goal of achieving one-third of our revenues from the aftermarket business,” says Dasari, who expects the drive to bring around Rs 1,000-crore (Rs 10 billion) revenue in the next three-five years. iAlert, a telematics (technology that allows information to be sent over long distances using computers) product that allows customers to track their vehicles in real time. Its live dashboard displays real-time information on the vehicle’s health, and sends alerts to the customer’s mobile if required. Service mandi, which connects customers to Leyland-trained mechanics. They can get live mobile updates on their vehicle repair. It allows digital payment on pre-agreed rate. E-diagnostics, which Leyland claims is a first-of-its-kind in the commercial vehicle industry; the diagnostic device pinpoints the error code for a vehicle by connecting the user’s phone with his vehicle via Bluetooth. A troubleshooting list pops up to help the mechanic or the driver resolve the error in a simple step-by-step visual process. LeyKart, which offers round-the-clock availability of genuine spare parts. Customers can search for the part they require by entering their vehicle registration number or selecting the relevant part from the list. They can add their choice to the Kart and pay digitally. The parts will be dispatched to their address from the nearest warehouse and they can track the shipment on mobile. The management believes the four new solutions will enhance customer profitability, and in turn drive company profitability. They can be tapped to cater to segments such as passenger cars, light commercial vehicles and two-wheelers. Leyland is also planning to exploit smartphone penetration and work like any other app. To support the growing network of customers, Leyland has invested in creating a digital marketplace to support them. The digital solutions are an integral part of its growth plan and has the potential to overhaul the commercial vehicle ecosystem. Venkatesh Natarajan, senior vice-president, IT, and chief information officer, Leyland, says in the last three-four years, the company has focused significantly on areas such as product development and expansion of network to enhance customer service to deliver on its promise of “Aapki jeet, hamari jeet”, its tagline. In 2012, Leyland had 500-plus customer service touch points. They have increased to about 2,500. “The idea is whichever side the customer turns his head to, he should see our service point.” Leyland has been considering how to leverage technology to improve customer profitability and experience. “It depends on the availability of vehicles and keeping the wheels rolling 24x7, which is customer expectation,” Natarajan adds. He says that around 65-70 per cent of commercial vehicles that are out of warranty are serviced by mechanics. Product-led business models are ceding ground to solutions-based models anchored on digital platforms and in the process, OEMs are facing unorthodox rivals in the business such as technology start-ups. How about a 'Think for India' campaign? Does investing in skilling help the employer?